Received: May 20, 2018; Revised: June 19, 2018; Accepted: June 26, 2018; Published online: August 22, 2018. The global obesity epidemic and associated metabolic diseases require alternative biological targets for new therapeutic strategies. In this study, we show that a phytochemical sulfuretin suppressed adipocyte differentiation of preadipocytes and administration of sulfuretin to high fat diet-fed obese mice prevented obesity and increased insulin sensitivity. These effects were associated with a suppressed expression of inflammatory markers, induced expression of adiponectin, and increased levels of phosphorylated ERK and AKT. To elucidate the molecular mechanism of sulfuretin in adipocytes, we performed microarray analysis and identified activating transcription factor 3 (Atf3) as a sulfuretin-responsive gene. Sulfuretin elevated Atf3 mRNA and protein levels in white adipose tissue and adipocytes. Consistently, deficiency of Atf3 promoted lipid accumulation and the expression of adipocyte markers. 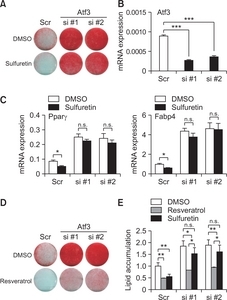 Sulfuretin’s but not resveratrol’s anti-adipogenic effects were diminished in Atf3 deficient cells, indicating that Atf3 is an essential factor in the effects of sulfuretin. These results highlight the usefulness of sulfuretin as a new anti-obesity intervention for the prevention of obesity and its associated metabolic diseases. Adipocytes are central for energy storage and an endocrine organ in vertebrates, react to various hormones, feeding, and exercise, and produce fatty acids (Lazar, 2005; Tontonoz and Spiegelman, 2008; Hong and Park, 2010). They also secrete numerous adipokines including adiponectin, resistin, Tnf-α, and leptin (Waki and Tontonoz, 2007). Adiponectin improves systemic insulin sensitivity, whereas Tnf-α and resistin lead to insulin resistance. Leptin regulates energy homeostasis by inhibiting appetite (Zhang et al., 1994; Halaas et al., 1995). Adipocytes are generated by the activation of transcriptional cascades and signaling pathways. Peroxisome proliferator-activated receptor γ (Pparγ) is essential for adipocyte differentiation (Tontonoz and Spiegelman, 2008). The CCAAT/enhancer protein (C/ebp) family is part of a positive feedback loop involving Pparγ (Wu et al., 1995). Transcriptional up-stream factors such as early B cell factors, Interferon regulatory factors, Kruppel-like factors, Krox-20, and Zinc finger proteins also control the expression and activity of Pparγ (Lazar, 2005; Tontonoz and Spiegelman, 2008; Hong and Park, 2010). The wingless–type MMTV integration site, tumor growth factor-β, bone morphogenetic protein, Notch, and Insulin signaling pathways also converge onto Ppar or C/ebp for the regulation of adipogenesis (Rosen and MacDougald, 2006; Tontonoz and Spiegelman, 2008). Activation of Pparγ increases transcription of its target genes involved in fatty acid synthesis, storage, and adipocyte differentiation (Lehmann et al., 1995). Pparγ activation by thiazolidinedione (TZD) in mice and humans, improves insulin sensitivity (Nolan et al., 1994; Willson et al., 2001). However, owing to the harmful effects of TZD in human diabetic patients, alternative strategies are required (Nissen and Wolski, 2007; Graham et al., 2010). Therefore, the identification of new Pparγ and adipogenic regulators could provide potential alternative targets for treating obesity and related metabolic diseases. Bioactive small molecules can be used as biological tools to identify new molecular targets; (Hasani-Ranjbar et al., 2009; Yang and Kang, 2018). Sulfuretin has been isolated from the edible Dahlia, Bidens tripartite, and Dipterx lacunifera (Orhan et al., 2016). It is also a major flavonoid from Toxicodendron vernicifluum, which has traditionally been used as a food additive, a natural dye, and an herbal medicine in East Asia (Kim et al., 2014a). Sulfuretin has been shown to suppress inflammation through downregulation of Nf-κB, ameliorate arthritis in mice, and prevent streptozocin-induced diabetes by protecting against beta cell damage (Kim et al., 2014a; Song et al., 2015). However, the effects of sulfuretin on obesity and molecular mechanisms in adipogenesis remain to be elucidated. In this study, we investigated the actions of sulfuretin for adipocyte differentiation and its effects on obesity and insulin sensitivity in high fat diet (HFD)-fed obese mice. We also attempted to show that the activating transcription factor 3 (Atf3), a family of basic leucine zipper transcription factor induced by sulfuretin, exhibited inhibitory effects on lipid accumulation. Taken together, these findings show potential use of sulfuretin for therapeutic applications in obesity and associated metabolic diseases. Sulfuretin, (Z)-2-(3,4-dihydroxybenzylidene)-6-hydroxybenzofuran-3(2H)-one, was synthesized and verified. To a mixture of 150 mg (1 mmol) of 6-hydroxybenzofuran-3(2H)-one and 138 mg (1 mmol) of 3,4-dihydroxybenzaldehyde in ethanol (5 ml), 12 N HCl (1.5 ml) was added dropwise at 0°C. Then the reaction mixture was allowed to stir at 60°C until the substrates were disappeared on TLC. The mixture was poured into water and the resulting precipitate was filtered and dried in vacuum. The crude product was recrystallized by MeOH/H2O to yield 216 mg (79%) of sulfuretin as an orange powder. The synthesized sulfuretin was identified by LC/MS. LC was performed on WATERS ACQUITY UPLC BEH C18 column (2.1×100 mm; Waters, Milford, MA, USA). The mobile phase A was 0.1% formic acid in water and phase B was 0.1% formic acid in acetonitrile. Mass spectrum was performed with Micromass Quattro Micro API mass spectrometer (Waters). The monoisotopic mass of deprotonated sulfuretin [M–H]− was detected at a retention time of 3.3 min on low resolution mass spectrometry (LRMS). And the one of protonated sulfuretin [M+H]+ was confirmed by high resolution mass spectrometry (HRMS) analyses. LRMS and HRMS were performed with Micromass Quattro Micro API and LTQ Orbitrap XL (Thermo Fischer Scientific, Waltham, MA, USA), respectively, using electron spray ionization (ESI). Additionally, the sulfuretin was identified by the spectrum of 1H and 13C NMR. The 1H and 13C NMR spectra were recorded on Avance III 700 (Bruker Biospin, Rheinstetten, Germany). NMR chemical shifts were measured in parts per million (ppm) from specific solvent (DMSO-d6) signal. Multiplicities were indicated as follows: d (doublet); dd (doublet of doublet). Coupling constants were reported in Hz.mp 280–285°C; 1H-NMR (700 MHz, DMSO-d6): δ 11.2 (1H, brs), 7.61–7.60 (1H, d, J=8.4 Hz), 7.46–7.46 (1H, d, J=2.1 Hz), 7.26–7.24 (1H, dd, J=2.1, 8.4 Hz), 6.85–6.84 (1H, dd, J=3.5, 4.2 Hz), 6.78–6.77 (1H, d, J=2.1 Hz), 6.72–6.71 (1H, dd, J=2.1, 8.4 Hz), 6.64 (1H, s), 6.31 (1H, d, J=2.4 Hz); 13C NMR (175 MHz, DMSO-d6) δ 181.65, 167.86, 166.64, 148.48, 146.10, 146.00, 126.16, 125.03, 123.84, 118.39, 116.52, 113.63, 113.35, 112.38, 98.84; Ms(ESI) m/z: 269.0 (M–H)−; HRMS (ESI) m/z: Calcd. for [M+H]+ C15H11O5: 271.0606; found: 271.0605. Other compounds including Dexametasone, IBMX (3-isobutyl-1-methylxanthine), insulin, resveratrol, troglitazone, and various flavonoids were purchased from Sigma Aldrich (St. Louis, MO, USA). C3H10T1/2 multipotent cells and 3T3-L1 cells were purchased from the American Type Culture Collection (Manassas, VA, USA). C3H10T1/2 cells were maintained at 37°C in a 5% CO2 incubator in Dulbecco’s modified Eagle’s medium (DMEM) (Hyclone, Logan, UT, USA) supplemented with 10% fetal bovine serum (Hyclone) and antibiotics. 3T3-L1 preadipocytes were cultured in DMEM containing 10% fetal calf serum (Hyclone) with antibiotics. To induce adipocyte differentiation, cells were seeded at 5×104/ml in 6-well plates and cultured for 72 hours. The confluent cells were stimulated to differentiate into adipocytes by switching media containing DMEM supplemented with 10% FBS, 1 µM dexamethasone, 0.5 mM isobutyl-1-methylxanthine, and 5 µg/ml insulin. After 2 days, the adipogenic medium was changed to DMEM, FBS and insulin containing media. C3H10T1/2 cells were induced into adipocytes with the adipogenic media further supplemented with 1 µM troglitazone (Sigma Aldrich). Primary bone marrow cells were isolated from 8-week-old Sprague–Dawley female rats (Orient. Co. LTD, Youngin, Korea) and cultured using a procedure described previously. The differentiated cells were fixed with 4% paraformaldehyde at room temperature for 4 h and stained with 0.5% Oil Red O (Sigma Aldrich) for 45 min. To measure intracellular triglyceride contents, Oil Red O stained cells were resolved with isopropanol and quantified by a spectrophotometer. Total RNAs were isolated from C3H10T1/2 adipocytes treated with 20 µM of sulfurein or DMSO for 6 hours and further purified using RNAeasy columns (QIAGEN, Chatsworth, CA, USA). cDNA preparation and hybridization to Affymetrix Mouse Genome Arrays (430 version 2.0) were performed by Genochek (Seoul, Korea). The data were analyzed using GeneSpring GX 7.3 software (Agilent Technologies, Palo Alto, CA, USA). Microarray data sets were deposited at Gene Expression Omnibus (accession number GSE76672). Total RNA from cells was isolated using TRIzol reagent (Invitrogen, Carlsbad, CA, USA). Total RNA were reverse transcribed using PrimeScript 1st strand cDNA synthesis kits (6110A, Takara, Ohtsu, Japan) at 42°C for 60 min. The synthesized cDNA was heat inactivated at 95°C for 5 min and amplified with a thermal cycler dice (Takara) using the Power SYBR Premix Ex Taq (RP041A, Takara). To isolate total RNA from adipose tissues, homogenized TRIzol samples were centrifuged to remove lipid layer. The lysates were further cleaned with 2 times of phenol-chloroform extraction followed by ethanol precipitation. Total RNAs were reverse transcribed and CDNA was used for realtime PCR analysis. Expression was normalized to 36B4. Gene specific primers were described previously (Song et al., 2015). Western blotting was performed as described previously. Briefly, cells treated with sulfuretin were lysed in RIPA buffer (1% NP-40, 50 mM Tris-HCl, pH 7.4, 150 mM NaCl, and 10 mM NaF) containing a protease inhibitor cocktail (Roche Diagnostics, Manheim, Germany). White adipose tissues were ground in liquid nitrogen and homogenized in RIPA buffer and protease inhibitors (Roche Diagnostics) for 60 min on ice. Then, the lysates were centrifuged for 10 min at 14,000 rpm at 4°C and supernatants collected. Protein lysates were separated on SDS-PAGE, transferred to PVDF membranes (Bio-Rad Laboratories, Hercules, CA, USA), and western blot analysis was performed as described. The membranes were blocked for 1 hour with 5% non-fat dry milk and incubated 2 hours at room temperatures with primary antibodies against PPARγ (sc-7196; Santa Cruz Biotechnology, Santa Cruz, CA, USA) or β-actin antibodies (A5316; Sigma Aldrich). The membranes were then probed with HRP-conjugated secondary antibodies (1:10,000, AbFrontier, Seoul, Korea) and developed by an enhanced chemiluminescent western blotting detection reagent (GE healthcare, MA, USA). Male C57BL/6 mice (7 week olds) were purchased from Central Lab Animal Inc (Seoul, Korea). The mice were individually housed in a temperature-controlled room with a 12-hour light/dark cycle. After 1 week of adaption, the 8 week olds mice were randomly divided into four groups. The mice in one group were fed a normal diet (ND, n=8) while the other three groups (n=8 per group) were fed a high-fat diet containing 60% calories from fats, 20% from carbohydrates and 20% from protein (HFD; Research Diets Inc., New Brunswick, NJ, USA). Two of the groups of mice fed HFD were intraperitoneally injected with either daily dose of 5 mg/kg (HFD+Sulfuretin 5 mg/kg, n=8) or 10 mg/kg (HFD+Sulfuretin 10 mg/kg, n=8) of sulfuretin, while the other HFD group was treated with vehicle as a control (HFD, n=8) for 8 weeks. Body weight and food intake were measured twice per week. At the end of the experiment, tissues were dissected and weighed. Epididymal fats were fixed with 10% paraformaldehyde, dehydrated, and embedded in paraffin. Sections with a thickness of 4 µm were subjected to hematoxylin and eosin (H&E) staining. Body weight was measured twice per week, and food intake was determined three times per week. During the treatment period, the body weight and food intake were measured twice weekly. For glucose tolerance tests, the mice were fasted for 6–12 hr, and then the glucose levels were determined from tail-vein blood at 0, 15, 30, 60, 90, and 120 min after i.p. injection of glucose (2 g/kg). For insulin tolerance tests, randomly fed mice were injected i.p. with insulin (Humulin R, Eli Lilly, Indianapolis IN, USA) (0.3 U/kg). The glucose levels were determined at the indicated minutes after glucose or insulin injection. All animal studies were carried out in accordance with the guidelines of the Animal Research Committee (SKKUIACUC-20150037) of Sungkyunkwan University. Data are presented as the means ± SD. Differences in gene expression and lipid accumulation were analyzed using a two-tailed unpaired Student’s t-test or analysis of variance (ANOVA) followed by a Student-Newman-Keuls test. All computations were performed using statistical analysis software (SPSS Statistics 21; IBM, Armonk, NY, USA). Pearson’s correlation coefficients were used to describe the linear association between variables. Statistical significance was considered when a p-value was less than 0.05. Sulfuretin isolated from Toxicodendron vernicifluum regulates various biological activities associated with inflammation, arthritis, and diabetes (Kim et al., 2014a). However, little is known about the role of sulfuretin in obesity and associated metabolic dysfunctions. To test the anti-lipogenic effects of sulfuretin, we treated 3T3-L1 preadipocytes with a non-toxic concentration of sulfuretin (Supplementary Fig. 1) and assessed the effects on lipid accumulation. Sulfuretin inhibited lipid accumulation (Fig. 1A) and reduced the Pparγ protein expression (Fig. 1B). In line with this, the mRNA expression of Pparγ and differentiation-dependent Pparγ target genes including Fabp4, C/ebpα, and Lpl were also suppressed by sulfuretin, comparable to those by a known anti-adipogenic compound, resveratrol (RSV) (Fig. 1C). Similarly, sulfuretin suppressed the expression of Pparγ and C/ebpα in primary bone marrow cells isolated from rat tibiae (Fig. 1D). Thus, reduced lipid accumulation and the expression of adipocyte markers indicate the inhibitory effects of sulfuretin in adipogenesis. Sulfuretin (5–10 mg/kg per day) was intraperitoneally injected into normal diet fed mice for 10 weeks and measured mouse weight, food intake, and well-being. A group of mice injected with sulfuretin showed no differences in well-being, as evaluated by food intake, weight gains, and tissue weight compared to the control group (Supplementary Fig. 2). Mice also did not show any notable skin, organ failure, or toxicity, suggesting that the aforementioned doses of sulfuretin is well-tolerated. Based on the anti-lipogenic effects of sulfuretin, we investigated the preventive actions of sulfuretin in obese mice. To test the effects in vivo, a daily dose of 5 or 10 mg/kg of sulfuretin was intraperitoneally delivered into high-fat diet (HFD)-fed obese mice for 8 weeks. 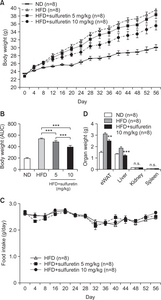 Compared to the vehicle-injected control (0.01% DMSO in PBS) mice, administration of sulfuretin at 5 and 10 mg/kg/day significantly prevented body weight gain in mice fed a HFD (Fig. 2A, 2B) though the food intake was similar in these groups (Fig. 2C). Liver and epididymal white adipose tissue (eWAT) weights were also reduced, but kidney and spleen weights were not different (Fig. 2D). Histological observation revealed reduced lipid accumulation in the liver and white adipose tissue with smaller adipocytes from sulfuretin-treated mice (Fig. 3A, 3B, Supplementary Fig. 3). Sulfuretin significantly reduced the levels of fasting serum glucose, triglycerides, and total cholesterol levels (Supplementary Table 1). These findings show the anti-obese actions of sulfuretin in HFD-induced obese mice. To determine whether sulfuretin treatments improves diet-induced insulin resistance, we performed glucose tolerance test (GTT) and insulin tolerance test (ITT). Sulfuretin treatments improved glucose metabolism in the HFD-fed obese mice (Fig. 3C, 3D). Similarly, 16-hour-fasting blood glucose levels of the sulfuretin treated group were lower (17%) compared to the control group, but fasting insulin levels were similar (Supplementary Table 1). Chronically elevated adipose tissue inflammation by infiltrated macrophages is associated with metabolic dysregulation including insulin resistance. To this end, we examined the levels of obesity-associated inflammatory cytokines. Sulfuretin reduced the expression levels of the obesity associated macrophage markers Adgre1 (F4/80) and Lgals3 (Mac2) as well as inflammatory mediators of Tnf-α. In contrast, sulfuretin induced expression of adiponectin (but not glut4) in the eWAT (Fig. 4A, 4B) and differentiated adipocytes (Supplementary Fig. 4). These results show that sulfuretin suppressed adipose tissue associated inflammation in HFD-fed obese mice. Sulfuretin also decreased the hepatic Tnf-α and other cytokines expression (Fig. 4C), consistent with the improved insulin sensitivity by sulfuretin. Furthermore, sulfuretin treatment has been shown to inhibit the serum Tnf-a levels in arthritis mice (Lee et al., 2012). Therefore, the suppressed Tnf-α levels by sulfuretin may play a role in improving insulin sensitivity in HFD-fed obese mice. To test whether enhanced insulin sensitivity can be translated into increased insulin signaling, we measured insulin-stimulated AKT phosphorylation in insulin-sensitive tissues. 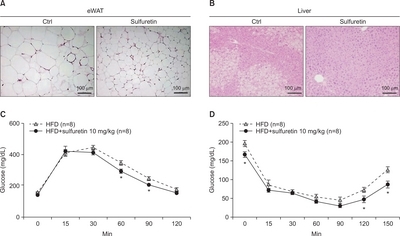 Sulfuretin increased phosphorylated levels of AKT in white adipose, muscle, and liver tissues, further corroborating enhanced insulin sensitivity in the sulfuretin-treated obese mice (Fig. 4D). Sulfuretin treatment also increased levels of phosphorylated ERK in these insulin-sensitive tissues. Furthermore, sulfuretin treatments increased insulin receptor β phosphorylations in 3T3-L1 adipocytes (Supplementary Fig. 5). Together, these findings show that sulfuretin can prevent obesity and improve insulin sensitivity in HFD-induced obese mice. Since Pparγ and adipogenesis can be regulated by signaling cascades including Wnt, Tgf-β, BMP, Notch, and Insulin-signaling pathways, we first examined the possible regulation of sulfuretin on these adipogenic related signaling cascades. Treatments of sulfuretin from 0.5 to 12 hours did not affect any known pathway-selective gene expression (Supplementary Fig. 6). Therefore, to delineate the molecular mechanisms of sulfuretin in adipocytes, we treated C3H10T1/2 adipocytes with sulfuretin or DMSO for 6 hours and analyzed the mRNA expression profiles. Following sulfuretin treatment, 68 genes were induced 1.8-fold or more, relative to DMSO treatment (Supplementary Table 2). It is noteworthy that more than half (36 out of 68) of the induced genes including the most highly-induced gene (Ho-1, 13.78-fold) were NF-E2-related factor 2 (Nrf2) target genes. This suggests that Nrf2 activation may mediate the anti-adipogenic effects of sulfuretin and thus to test the importance of this, Keap1 (the negative regulator of Nrf2) deleted cells were treated with sulfuretin. The induction of Nrf2 target genes, including Ho-1, Nqo-1, Gclm, and Gclc, by sulfuretin was diminished in Nrf2-activated Keap1 −/− cells, while Pparγ and Fabp4 were still suppressed by sulfuretin in the Keap1 −/− cells (Supplementary Fig. 7). To further ensure the non-essential role of Nrf2 in sulfuretin’s anti-adipogenic actions, Nrf2 deleted (knockout) mouse embryonic fibroblast (MEF) were treated with sulfuretin for 4 days and the inhibitory effects on Pparγ expression as well as on the expression of its target genes Fabp4, C/ebpα, and Cd36 were investigated. Sulfuretin maintained its regulatory effects on the expression of Pparγ and its target genes in both Nrf2 −/− and wild type MEF (Supplementary Fig. 8), further indicating that Nrf2 is not essential gene for sulfuretin’s actions in the suppression of lipogenesis and adipocyte-related gene expression. Since adipogenesis is orchestrated by a cascade of transcription factors, we next focused on 14 transcriptional regulators from the sulfuretin-induced genes (Supplementary Table 2). Out of these, the transcriptional regulators of Nrf2 (Ho-1, GCLC, Lcor, and Tshz1) and those associated with Nrf2 activation (Maff, Mafg, and c-Jun) were excluded, so seven transcriptional regulators remained (Zfp770, Zfp655, Hsf2, Rora, Preb, Bach1, and Atf3) (Supplementary Fig. 9). We then examined the expression of these selected transcriptional regulators after sulfuretin treatment to identify genes that were early induced by sulfuretin (Fig. 5A, 5B). Only activating transcription factor 3 (Atf3) was induced 2 hours after sulfuretin treatment in both 3T3-L1 and C3H10T1/2 preadipocytes (Fig. 5A, Supplementary Fig. 9). In contrast to the early induction of Atf3, those of Nrf2 target genes (Ho-1, Gclc, P62, and Nqo-1) by sufuretin were delayed as detected between 6 hours and 12 hours in 3T3- L1 preadipocytes, further showing sulfuretin-mediated Nrf2 activation as the later responses (Fig. 5B). To further verify the in vivo induction of Atf3 by sulfuretin, we determined the expression levels of adipose Atf3 in sulfuretin-treated chow-diet-fed lean and HFD-fed obese mice. Sulfuretin treatment significantly elevated Atf3 mRNA and protein levels in epididymal (eWAT) and inguinal white adipose tissue (iWAT) in lean and obese mice (Supplementary Fig. 10, Fig. 5C, 5D), demonstrating that Atf3 is a sulfuretin-induced gene in adipocytes and adipose tissue. Recent studies have shown that forced expression of Atf3 in 3T3-L1 preadipocytes inhibits adipocyte differentiation and Pparγ expression (Jang et al., 2012). These prompted us to examine whether Atf3 is required for the action of sulfuretin in adipocytes. To this end, we transfected two independent small interfering RNAs (siRNAs) targeting Atf3 into 3T3-L1 cells and treated them with sulfuretin. As expected, sulfuretin decreased lipid accumulation in scrambled (scr) control siRNA-transfected cells. Expressions of adipocyte markers were consistently decreased by sulfuretin in control cells. However, sulfuretin’s anti-lipogenic effects as shown by oil red O staining were significantly impaired in the Atf3-deficient cells (Fig. 6A, 6B). The expression of Pparγ and Fabp4 further corroborated the necessity of Atf3 for sulfuretin-mediated anti-adipogenic effects (Fig. 6C). Another anti-adipogenic compound, resveratrol, was also still able to exert its effects, even in the absence of Atf3 (Fig. 6D, 6E), supporting the specificity of Atf3-mdiated sulfuretin’s inhibitory ability in lipid accumulation. For an additional confirmation of the Atf3’s necessity in the anti-adipogenic actions of sulfuretin, Atf3 −/− MEFs were treated with sulfuretin for 4 days and the inhibitory effects on the expression of Pparγ and its target genes were measured. Sulfuretin suppressed Pparγ, Fabp4, C/ebpα, and Cd36 expression in wild type cells. However, consistent with our data, the inhibitory effects of sulfuretin on the expression of adipocyte markers were significantly compromised in the absence of Atf3 (Supplementary Fig. 11). These results further prove that Atf3 is vital for sulfuretin mediated activities on the suppression of lipogenesis and adipocyte-related gene expression. In this study, we demonstrated the protective roles of sulfuretin in obesity and the glucose metabolism. How, then, does sulfuretin protect against metabolic defects in the HFD-induced obese mice? Anti-inflammatory effects in those mice may be a part of the sulfuretin-mediated anti-obese effects. Our analysis on the reduction of inflammatory gene expression in fat tissues by sulfuretin suggest the contribution of anti-inflammatory effects of sulfuretin in the HFD-fed obese mice. Alternatively, sulfuretin may prevent beta cell damages, resulting in higher insulin secretion. However, we failed to observe differential insulin levels in the control and sulfuretin-treated obese mice. The beneficial effects of sulfuretin on metabolism can be attributed to the combined actions of reduced body weight and anti-inflammatory effects; the decreased pro-inflammatory cytokines in liver and reduced lipogenic effects through induction of Atf3 expression in adipocytes mediate anti-obese and insulin sensitizing effects of sulfuretin. In our experiment, increased insulin sensitivity by sufuretin was revealed by sustained AKT and ERK activation in metabolic organs including eWAT, iWAT, livers, and muscles also suggesting the additive actions by these insulin-sensitive organs. Therefore, careful investigation is warranted to determine the role of sulfuretin’s tissue-specific effects in obesity and the glucose metabolism. Since small molecules can regulate various signaling pathways or target proteins (Ding and Schultz, 2004; Wang et al., 2014), it is reasonable to postulate that sulfuretin also affect various other biological activities in numerous cell types. Atf3, a presumed early target of sulfuretin, precedes the effects on Nrf2 signaling as evidenced by the later induction of Nrf2 target gene expression by sulfuretin. It is important that a deficiency of Atf3 but not Nrf2 or Keap1 almost completely reduced the ability of sulfuretin to suppress the expression of adipocyte related transcripts, suggesting the functional significance of Atf3 in sulfuretin-mediated anti-adipogenesis. Therefore, it is tempting to speculate that Atf3 relays sulfuretin’s messages to anti-lipogenic actions and possibly Nrf2 signaling pathways. In line with this notion, it has been reported that Atf3 enhances Nrf2 expression by preventing degradations in lung injury (Shan et al., 2015). Hence, further studies aimed at understanding molecular targets and links among sulfuretin, Atf3, and Nrf2 signaling in adipocytes will be of particular interest. We showed in this study that sulfuretin exhibited anti-adipogenic effects, dependent on the presence of Atf3. Atf3 is induced by various cellular stresses and it is related to mitochondrial dysfunction. Atf3 inhibits adipocyte differentiation and Pparγ consistent with our current studies (Hai et al., 2010; Jang et al., 2012). Given the inhibitory action of Atf3 on lipid accumulation and adipogenesis, we posit the protective effects of Atf3 in diet induced obesity. However, the role of Atf3 in obese mice is still controversial. Previous studies reported that Atf3 takes parts in causing insulin resistance, irrespective of obesity (Qi et al., 2009; Favre et al., 2011). Atf3 was also suggested to be a part of stimulating inflammation, beta cell apoptosis, and adipokine expression in insulin-resistant adipose tissues (Hartman et al., 2004; Hai et al., 2010; Kim et al., 2014b; Nguyen et al., 2016). By contrast, other studies have shown that Atf3 is a protective player against glucose intolerance in HFD-fed mice and that Atf3 prevents obesity and improves lipid metabolism in flies (Zmuda et al., 2010; Rynes et al., 2012). Atf3 overexpression in macrophage attenuates adipose inflammation in obese KKAy mice (Suganami et al., 2009). Therefore, although the exact reasons for the contradictory roles of Atf3 in metabolisms are unknown, various experimental conditions such as differential strains, ages, and duration of HFD feeding bear the possibility to explain the variation (Zmuda et al., 2010). It is also possible that Atf3 play differential roles in different metabolic tissues as Atf3 has been shown to play a dichotomous role in breast cancer cells (Yin et al., 2008). Atf3 expression is ubiquitous and thus it may mediate tissue specific functions in various tissues (Hartman et al., 2004; Hai et al., 2010; Kim et al., 2014b; Nguyen et al., 2016). As such, the adipose-specific role of Atf3 by generating fat-specific knockout mice should be addressed. Sulfuretin found in edible and medicinal plants exerts various effects including in the attenuation of allergy, arthritis, lymphedema, calvarial defects, and the prevention of Type 1 diabetes in animal models (Song et al., 2010a, 2010b; Lee et al., 2012; Auh et al., 2016; Roh et al., 2017). Given the responses in the diet induced obese mice, sulfuretin may provide a new approach for the possible use in adiposity and its related metabolic diseases. However, since human and mice could be divergent in life span and metabolism, future studies targeting the prevention of metabolic diseases in human are also needed to further explore this potential. This study was supported by the Basic Science Research Program through the National Research Foundation of Korea (NRF), funded by the Ministry of Education, Science, and Technology (NRF-2016M3A9B6903451 and NRF-2017R1A2B4002005 to KWP and NRF-2017R1A6A3A110 295845 to UJY). Fig. 1. 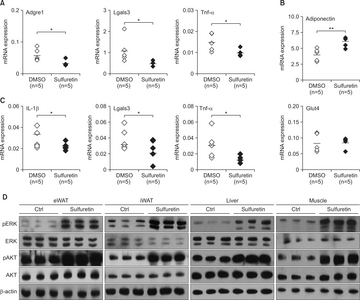 Sulfuretin inhibits lipid accumulation and adipocyte differentiation. (A–C) Sulfuretin suppressed adipocyte differentiation in 3T3-L1 preadipocytes. (A) Sulfuretin suppressed lipid accumulation as assessed by Oil red O staining. (B) 3T3-L1 preadipocytes were treated with sulfuretin for seven days during adipocyte differentiation and Pparγ protein levels were measured by Western blotting and (C) mRNA expression levels of Pparγ, Fabp4, C/ebpα, and LPL were measured by real time PCR. Resveratrol (RSV) treated at 20 µM for 7 days was used as a control. (D) Primary bone marrow cells isolated from rat tibiae were treated with sulfuretin (10 µM) for seven days and the expression of Pparγ and C/ebpα mRNA was quantified. Data shown represent means ± SEM. Statistical significance was determined relative to a control by a Student’s t-test (*p<0.05, **p<0.005, ***p<0.0005). Fig. 2. Chronic treatment of sulfuretin prevents obesity in HFD-fed obese mice. (A) Sulfuretin treatment decreased body weight gain in HFD-fed mice. Eight-week-old male C57BL/6J mice were fed a normal diet (ND, 20% fat) or a high fat diet (HFD, 60% fat) and treated with a vehicle or sulfuretin (5 mg/kg or 10 mg/kg) for 8 weeks. Mice were weighed every four days (n=8 per group). (B) Significant differences in the area under the curve (AUC) of body weight changes. (C) Sulfuretin treatment did not affect food intake. Data indicate means ± SD (n=8 per group). (D) Organ weights of mice fed with high-fat diets and treated with a vehicle control or sulfuretin. Sulfuretin treatment decreased epididymal fat (eWAT) and liver weight gains but not kidney or spleen weights in the HFD-fed mice. Data represent means ± SEM (n=8 per group). Statistical significance was determined relative to a control by a Student’s t-test (**p<0.005, ***p<0.001, n.s., not significant). Fig. 3. Chronic treatment of sulfuretin ameliorates insulin resistance in obese mice. Haematoxylin and Eosin (H&E) sections of the eWAT (A) and the liver (B) from HFD fed mice with or without sulfuretin treatment for 8 weeks. Glucose tolerance test (C) and insulin tolerance test (D) results of the control and sulfuretin-treated groups (n=8 each) were shown. Glucose levels were measured from tail blood samples collected at the indicated time points. Data represent means ± SD (n=8 per group). The mice were treated daily with a vehicle or 10 mg/kg sulfuretin for 6 weeks prior to the experiment. Statistical significance was determined relative to a control by a Student’s t-test (*p<0.05). Fig. 4. Sulfuretin treatment suppresses inflammation and increases insulin signaling. (A) Expression levels of inflammatory genes (Adgre1, Lgals3, and Tnf-α) and (B) adiponectin and glut4 in epididymal adipose tissue were determined by real-time PCR after treatments with sulfuretin for 8 weeks. (C) Expression levels of inflammatory genes (IL-1β, Lgals3, and Tnf-α) in liver were determined by real-time PCR. Dots and bars in the scatter plots represent individual mice and the averages, respectively. Data represent means ± SEM (n=5 per group). Statistical significance was determined relative to a control by a Student’s t-test (*p<0.05, **p<0.005). (D) Western blot analysis on insulin signaling from the epididymal (eWAT), the inguinal white adipose tissue (iWAT), the liver, and muscles. Phosphorylated levels of AKT and ERK were increased in tissues from sulfuretin treated mice for eight weeks. Fig. 5. Identification of Atf3 as a sulfuretin-induced gene. (A) The temporal induction of Atf3 expression by sufuretin was measured by real-time PCR. Data shown represent the mean ± SD of representative data from three independent experiments. (B) The temporal expression of genes induced by sulfuretin. 3T3-L1 preadipocytes were treated with sulfuretin for the indicated time points and the expression of NRF2 target genes (Ho-1, GCLC, P62, GCLM, Nqo-1, and Osgin) was measured. (C) Induction of Atf3 by sulfuretin in the epididymal white adipose tissue from sulfuretin treated mice. Sulfuretin was treated at a daily dose of 10 mg/kg for eight weeks. Data shown represent the mean ± SEM. Statistically significant differences in gene expressions between the control and sulfuretin-treated HFD-fed obese mice (n=7 per group) were determined by a Student’s t-test (*p<0.05). (D) Induction of Atf3 protein by sulfuretin in the epididymal (eWAT) and inguinal (iWAT) white adipose tissues from sulfuretin-treated HFD-fed obese mice. Sulfuretin was administrated at a daily dose of 10 mg/kg for eight weeks. Fig. 6. The critical role of Atf3 on the sulfuretin-mediated anti-adipogenic axis. (A, B) Silencing the Atf3 expression blunted the inhibitory effects of sulfuretin on adipocyte differentiation in 3T3-L1 cells. (A) Knockdown of Atf3 attenuated the actions of sulfuretin on lipid accumulation. Lipid accumulation in control scrambled (scr) and siRNA-transfected cells (si #1, si #2) treated with DMSO or sulfuretin (20 µM) was assessed by Oil Red O staining. (B) Suppression of Atf3 expression by Atf3 targeting siRNA-transfected cells (si #1 and si #2) compared to control cells. (C) Sulfuretin decreased expression of Pparγ and Fabp4 in control siRNA-transfected cells (scr), whereas Atf3 siRNA-transfected cells displayed blunted effects of sulfuretin’s abilities on the Pparγ expression. (D) Knockdown of Atf3 did not interfere with the effects of resveratrol on lipid accumulation. Lipid accumulation in control (scr) and siRNA-transfected cells (si #1, si #2) treated with DMSO or resveratrol (20 µM) was assessed by Oil Red O staining. (E) Lipid accumulation in Atf3 siRNA-transfected cells treated with DMSO, sulfuretin, or resveratrol was quantified. Data represent means ± SD. Statistical significance was determined relative to a control by a Student’s t-test (*p<0.05, **p<0.005, n.s. not significant). Auh, QS, Park, KR, Yun, HM, Lim, HC, Kim, GH, Lee, DS, Kim, YC, Oh, H, and Kim, EC (2016). Sulfuretin promotes osteoblastic differentiation in primary cultured osteoblasts and in vivo bone healing. Oncotarget. 7, 78320-78330. Ding, S, and Schultz, PG (2004). A role for chemistry in stem cell biology. Nat. Biotechnol. 22, 833-840. Favre, D, Le Gouill, E, Fahmi, D, Verdumo, C, Chinetti-Gbaguidi, G, Staels, B, Caiazzo, R, Pattou, F, Le, KA, Tappy, L, Regazzi, R, Giusti, V, Vollenweider, P, Waeber, G, and Abderrahmani, A (2011). Impaired expression of the inducible cAMP early repressor accounts for sustained adipose CREB activity in obesity. Diabetes. 60, 3169-3174. Graham, DJ, Ouellet-Hellstrom, R, MaCurdy, TE, Ali, F, Sholley, C, Worrall, C, and Kelman, JA (2010). Risk of acute myocardial infarction, stroke, heart failure, and death in elderly Medicare patients treated with rosiglitazone or pioglitazone. JAMA. 304, 411-418. Hai, T, Wolford, CC, and Chang, YS (2010). ATF3, a hub of the cellular adaptive-response network, in the pathogenesis of diseases: is modulation of inflammation a unifying component?. Gene. Expr. 15, 1-11. Halaas, JL, Gajiwala, KS, Maffei, M, Cohen, SL, Chait, BT, Rabinowitz, D, Lallone, RL, Burley, SK, and Friedman, JM (1995). Weight-reducing effects of the plasma protein encoded by the obese gene. Science. 269, 543-546. Hartman, MG, Lu, D, Kim, ML, Kociba, GJ, Shukri, T, Buteau, J, Wang, X, Frankel, WL, Guttridge, D, Prentki, M, Grey, ST, Ron, D, and Hai, T (2004). Role for activating transcription factor 3 in stress-induced beta-cell apoptosis. Mol. Cell. Biol. 24, 5721-5732. Hasani-Ranjbar, S, Nayebi, N, Larijani, B, and Abdollahi, M (2009). A systematic review of the efficacy and safety of herbal medicines used in the treatment of obesity. World J. Gastroenterol. 15, 3073-3085. Hong, JW, and Park, KW (2010). Further understanding of fat biology: lessons from a fat fly. Exp. Mol. Med. 42, 12-20. Jang, MK, Kim, CH, Seong, JK, and Jung, MH (2012). ATF3 inhibits adipocyte differentiation of 3T3-L1 cells. Biochem. Biophys. Res. Commun. 421, 38-43. Kim, JH, Shin, YC, and Ko, SG (2014a). Integrating traditional medicine into modern inflammatory diseases care: multitargeting by Rhus verniciflua Stokes. Mediators Inflamm. 2014, 154561. Kim, MJ, Jang, WS, Lee, IK, Kim, JK, Seong, KS, Seo, CR, Song, NJ, Bang, MH, Lee, YM, Kim, HR, Park, KM, and Park, KW (2014b). Reciprocal regulation of adipocyte and osteoblast differentiation of mesenchymal stem cells by Eupatorium japonicum prevents bone loss and adiposity increase in osteoporotic rats. J. Med. Food. 17, 772-781. Lazar, MA (2005). PPAR gamma, 10 years later. Biochimie. 87, 9-13. Lee, YR, Hwang, JK, Koh, HW, Jang, KY, Lee, JH, Park, JW, and Park, BH (2012). Sulfuretin, a major flavonoid isolated from Rhus verniciflua, ameliorates experimental arthritis in mice. Life Sci. 90, 799-807. Lehmann, JM, Moore, LB, Smith-Oliver, TA, Wilkison, WO, Willson, TM, and Kliewer, SA (1995). An antidiabetic thiazolidinedione is a high affinity ligand for peroxisome proliferator-activated receptor gamma (PPAR gamma). J. Biol. Chem. 270, 12953-12956. Nguyen, CT, Kim, EH, Luong, TT, Pyo, S, and Rhee, DK (2016). ATF3 confers resistance to pneumococcal infection through positive regulation of cytokine production. J. Infect. Dis. 210, 1745-1754. Nissen, SE, and Wolski, K (2007). Effect of rosiglitazone on the risk of myocardial infarction and death from cardiovascular causes. N. Engl. J. Med. 356, 2457-2471. Nolan, JJ, Ludvik, B, Beerdsen, P, Joyce, M, and Olefsky, J (1994). Improvement in glucose tolerance and insulin resistance in obese subjects treated with troglitazone. N. Engl. J. Med. 331, 1188-1193. Orhan, N, Icoz, UG, Altun, L, and Aslan, M (2016). Anti-hyperglycaemic and antioxidant effects of Bidens tripartita and quantitative analysis on its active principles. Iran. J. Basic Med. Sci. 19, 1114-1124. Qi, L, Saberi, M, Zmuda, E, Wang, Y, Altarejos, J, Zhang, X, Dentin, R, Hedrick, S, Bandyopadhyay, G, Hai, T, Olefsky, J, and Montminy, M (2009). Adipocyte CREB promotes insulin resistance in obesity. Cell Metab. 9, 277-286. Roh, K, Kim, S, Kang, H, Ku, JM, Park, KW, and Lee, S (2017). Sulfuretin has therapeutic activity against acquired lymphedema by reducing adipogenesis. Pharmacol. Res. 121, 230-239. Rosen, ED, and MacDougald, OA (2006). Adipocyte differentiation from the inside out. Nat. Rev. Mol. Cell Biol. 7, 885-896. Rynes, J, Donohoe, CD, Frommolt, P, Brodesser, S, Jindra, M, and Uhlirova, M (2012). Activating transcription factor 3 regulates immune and metabolic homeostasis. Mol. Cell. Biol. 32, 3949-3962. Shan, Y, Akram, A, Amatullah, H, Zhou, DY, Gali, PL, Maron-Gutierrez, T, Gonzalez-Lopez, A, Zhou, L, Rocco, PR, Hwang, D, Albaiceta, GM, Haitsma, JJ, and dos Santos, CC (2015). ATF3 protects pulmonary resident cells from acute and ventilator-induced lung injury by preventing Nrf2 degradation. Antioxid. Redox. Signal. 22, 651-668. Song, MY, Jeong, GS, Kwon, KB, Ka, SO, Jang, HY, Park, JW, Kim, YC, and Park, BH (2010a). Sulfuretin protects against cytokine-induced beta-cell damage and prevents streptozotocin-induced diabetes. Exp. Mol. Med. 42, 628-638. Song, MY, Jeong, GS, Lee, HS, Kwon, KS, Lee, SM, Park, JW, Kim, YC, and Park, BH (2010b). Sulfuretin attenuates allergic airway inflammation in mice. Biochem. Biophys. Res. Commun. 400, 83-88. Song, NJ, Kwon, SM, Kim, S, Yoon, HJ, Seo, CR, Jang, B, Chang, SH, Ku, JM, Lee, JS, Park, KM, Hong, JW, Kim, GH, and Park, KW (2015). Sulfuretin induces osteoblast differentiation through activation of TGF-beta signaling. Mol. Cell Biochem. 410, 55-63. Suganami, T, Yuan, X, Shimoda, Y, Uchio-Yamada, K, Nakagawa, N, Shirakawa, I, Usami, T, Tsukahara, T, Nakayama, K, Miyamoto, Y, Yasuda, K, Matsuda, J, Kamei, Y, Kitajima, S, and Ogawa, Y (2009). Activating transcription factor 3 constitutes a negative feedback mechanism that attenuates saturated Fatty acid/toll-like receptor 4 signaling and macrophage activation in obese adipose tissue. Circ. Res. 105, 25-32. Tontonoz, P, and Spiegelman, BM (2008). Fat and beyond: the diverse biology of PPARgamma. Annu. Rev. Biochem. 77, 289-312. Waki, H, and Tontonoz, P (2007). Endocrine functions of adipose tissue. Annu. Rev. Pathol. 2, 31-56. Wang, S, Moustaid-Moussa, N, Chen, L, Mo, H, Shastri, A, Su, R, Bapat, P, Kwun, I, and Shen, CL (2014). Novel insights of dietary polyphenols and obesity. J. Nutr. Biochem. 25, 1-18. Willson, TM, Lambert, MH, and Kliewer, SA (2001). Peroxisome proliferator-activated receptor gamma and metabolic disease. Annu. Rev. Biochem. 70, 341-367. Wu, Z, Xie, Y, Bucher, NL, and Farmer, SR (1995). Conditional ectopic expression of C/EBP beta in NIH-3T3 cells induces PPAR gamma and stimulates adipogenesis. Genes. Dev. 9, 2350-2363. Yang, DK, and Kang, H.-S (2018). Anti-diabetic effect of cotreatment with quercetin and resveratrol in streptozotocin-induced diabetic rats. Biomol. Ther. (Seoul). 26, 130-138. Yin, X, Dewille, JW, and Hai, T (2008). A potential dichotomous role of ATF3, an adaptive-response gene, in cancer development. Oncogene. 27, 2118-2127. Zhang, Y, Proenca, R, Maffei, M, Barone, M, Leopold, L, and Friedman, JM (1994). Positional cloning of the mouse obese gene and its human homologue. Nature. 372, 425-432. Zmuda, EJ, Qi, L, Zhu, MX, Mirmira, RG, Montminy, MR, and Hai, T (2010). The roles of ATF3, an adaptive-response gene, in high-fat-diet-induced diabetes and pancreatic beta-cell dysfunction. Mol. Endocrinol. 24, 1423-1433.